Several years ago, I bought a wall hanging with this saying on it. At the time I was surprised that the Buddha had figured out the relationship between our thoughts and our emotions/reality as described by Albert Ellis and Aaron Beck and the 20th-century forerunners and founders of CBT (Cognitive Behavioral Therapy). The Buddha understood the relationship between thoughts and emotions without relying on research!! The cornerstone of CBT is that our emotions and reactions are derived from our thoughts. If we want to change our emotions or reactions, we start by changing thoughts that are not factual, not balanced, or not otherwise useful. CBT calls these kinds of thoughts distorted. The CBT model teaches people how to restructure distorted thoughts into fact-based, balanced, and helpful ways of understanding an event, ourselves, and the world. The Buddha reminds us that our thoughts are powerful. Like the Buddha, many modern scientists and philosophers believe that our mind is the most powerful part of who we are as human beings. Both the Buddha and CBT invite us to be responsible about how we think about ourselves, others, and the world. Because, it is “with [these] thoughts that we make [our] world,” we create so much of our own reality. Our own worst enemy cannot harm us as much as our unwise thoughts. The Buddha talks about unwise thoughts in a way that sounds like CBT’s distortions. Specifically, what we say to and think about ourselves profoundly affects us. For those whose thoughts go to harsh judgments and criticisms about who we are, how we look, what we said, what we did, what we should have said and done . . . (you get the picture), life feels small, constrained, dark, and very painful. The Buddha reminds us that that these negative and distorted ways of speaking to and thinking about ourselves and the world cause us more suffering and destruction than our worst enemy can. People just feel better about themselves and their lives. CBT uses the vocabulary of factual, balanced, and helpful thoughts; Buddhism uses the vocabulary of compassion toward ourselves and others. However we get there it is a great place to be!! A day spent judging another is a painful day.The day spent judging yourself is a painful day. Judgments are labels we put on things, most often with a pejorative meaning. We use judgments as a way to see ourselves as better than or less than others, instead of seeing the humanity in everyone. Judgments lack compassion and curiosity, a pair worth noting. DBT (Dialectical Behavioral Therapy) is a therapy model related to CBT, but it addresses judgments and judgmental thinking. DBT introduces the state of mind—Wise Mind, which is the balance between emotional thinking and rational thinking. DBT specifically teaches that when we are in a Wise Mind state of being, we are being non-judgmental. CBT and DBT state that we are not our thoughts. Our thoughts are separate from us. We experience and can observe our thoughts; they come and go, and we can let the ineffective, not useful thoughts go. Words have the power to destroy or heal. From our thoughts to our words, the same observations apply. Just as we are encouraged to be responsible with our thoughts about ourselves and others, so too are we reminded to use our words with care when we speak with others. And no hiding behind the defense that anything can be said if it’s “true”! Truth is always to be tempered with kindness, another notable pair. The Buddha reminds us that when we bring together truth and kindness, change to ourselves and the world can occur. In the introduction to Jack Kornfield’s book Bringing Home the Dharma: Awakening Right Where You Are (2012),Daniel J. Siegal, M.D., a well-published neuroscientist, described Buddhism as “a science of mind and method of healing.” Siegal further explained, “I encountered Buddhism as a system of thought and understanding devoted to alleviating mental pain . 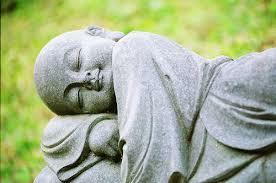 . . and linking the mindful brain with the wise heart.” I rest my case, Before CBT (and DBT) there was the Buddha!! Linda is a certified IFS therapist and also has extensive training in Somatic Experienced–based therapy and Dialectical Behavior Therapy. She has a great deal of experience working with those struggling with eating disorders, depression, trauma, and other life stressors.